Reyn Spooner and MLB are two American classics coming together to celebrate America's favorite pastime. 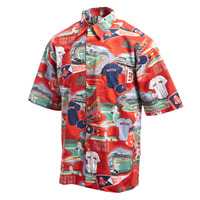 We've expanded our line of commemorative shirts to include Aloha prints with your favorite team logo, and scenic prints that are guaranteed to become a true fan favorite. Available in 100% cotton and rayon fabrics, in both men’s and boys’ sizes.